I am loving the Mentor Text linky party! I have found so many good ideas! This week focuses on Math! Since I taught 5th grade Math for 5 years, this should be a no brainer. 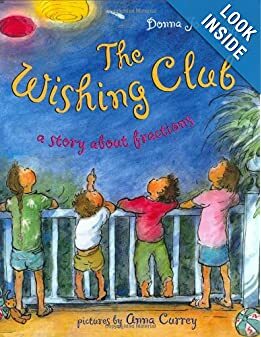 I have used many books in my lessons over the years, but The Wishing Club by Donna Jo Napoli is a must for teaching fractions. The nighttime magic of a wishing star provides the framework for a realistic story about fractions. When four children receive only a fraction of their wishes, they discover a pattern. Petey, who is four, gets one-fourth of a dollar, while two-year-old Joey gets half a cookie; eight-year-old twins Sally and Samantha each get one-eighth of a bag of marbles. On the last night that the comet is visible, the siblings decide to combine their wishes and ask for the pet they all want. The kids love this story! Yes, even my 5th graders! This books goes along with a Georgia Framework Task for Common Core standards. This book is great introduction on fractions or as a quick review, which is how I used it. What a great way to introduce kids to fractions. Thanks for the suggestion. Looks like a great book to add to my list! Thanks so much for sharing. Just found your blog today through the linky and am a new follower! Thanks Sarah! I am following you also! Thanks for the book suggestion. I certainly need to add another fraction text to my library. My kids really love it! Thanks for following! I haven't heard of this book, but since we teach in GA, it's great to know that it goes right along with our frameworks! Thanks so much for linking it up! The frameworks were down this morning. If you go under 5th grade math/fractions unit, you will see the worksheets that go with it. They can be used for many grade levels. Looks like a great book. I will need to check it out. Thanks for sharing!